This collection was part of the donation to SPARC from The Metropolitan Museum of Art/Costume Institute in 2011. Officially recognized by deed of gift 2013. 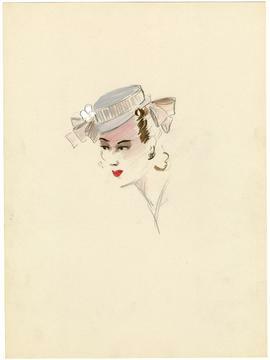 This collection is comprised of fashion sketches made for Hattie Carnegie, Inc. from 1940 - 1955. This collection contains millinery (hats) for which some designs can be attributed to Esther A. Kleeper in 1945. The remainder of the collection is ready-to-wear dresses and suits, along with evening wear, mostly ballgowns, that were adapted from French couturiers for the American woman. The skecthes have been divided into millinery, ready-to-wear, and evening wear. Many of the sketches are not dated, but based upon a survey of the collection and dates of similar physical garments made by Hattie Carnegie, Inc. it is assumed that the sketches are from the aforementioned dates.